Without the “understanding” of the mythical, there could be no “understanding” of the mystical. Myth does not mean lie, or fake, but it does imply non-historically real. It’s a myth first. We must obviously know the difference between history books, science books and religious books. If you look for the historical King David or Solomon you will find they are myths. I will not watch this movie. I will not watch any Jesus movie that portrays any biblical event as an historical fact. Literalism is totally meaningless dogma, and literally means nothing!! I don’t mean this to be overly specific, and I would be equally comfortable saying this about a Lakota ceremonial elder who was leading a sun dance, for instance. The dance could be interpreted by participants and outsiders alike in any number of ways. But there is power in the meaning it holds for the people, and meaning in the power that flows through the dance. Power in the ancestry that holds the space sacred, that responds to prayer, that heals hearts. Something happens, and it is not merely a story… We may interpret it any way we want, but power responded to power, Love responded to Love, and a child was healed… Not just metaphorically, you know? I so agree with this and feel weary of the modern inclination to demonize ourselves and to see animals as strictly innocent. Yes, we do have an expansive power of technology, but even if all human evil were to stop at this moment, life still feeds on life and to watch an animal take another weaker animal down, even when it is for food, speaks to the inherent essence of the world we live in, yes? It’s hard to bear. Perhaps we hear a different sense in the idea of metaphor? I don’t see it in opposition to unity, or as diluting the power out of experience, but rather expanding and deepening meaning from what sometimes seems constrictive. When attempts are made to narrow the definition of a thing or an experience to mean one thing only, I see that as diluting, watering down. The gift of metaphorical thinking or sensing is to know that the resurrection is in someway a real experience, that can be placed on a timeline, but that it also has other meanings, even if we don’t understand them yet. Metaphor is a way to leave a crumb on the plate, to feed the gods, keeping our awareness of them before us, so they continue to speak to us, revealing, as we go on our way, the deeper layers of the truth. Unity is real, but so is separation, falling into division. “What can be made whole must first be separated,” is an old alchemical saying. I wasn’t trying to pit interpretations against each other, but rather, reminding myself of the necessity to acknowledge that my own conclusions are deficient, as no one of us is ever granted a complete unveiling to see the Whole ShhBang. Yes! What you refer to as power, I would call immediacy of experience, or unmediated experience. We are all capable and perhaps called to whatever dance, ritual, prayer or meditation as acts of devotion in which the veil can be lifted. We do not disagree here, I think. I think that the sense of story, or storied lives gives us a way not to get stuck in any one particular way of viewing an event. I don’t story as being “only” a story. To see your life as a story is to let go of the insistence that things happened one way and one way only. You can never heal from something that keeps you stuck in that narrow of a view of yourself or of life, can you? Yes, healing is real, but even to say that is not enough, as if it’s an all or nothing experience. But that is part of the nature of language; to allow us to speak in absolutes when most often, our lived experience has nuance and degrees to it. I do love your questioning Michael and very much value this conversation because I think sorting out meaning and ideas lies at the heart of understanding each other and lifting the veil a little more. I so agree with the notion that a narrow view of things can preclude movement and transformation. It restricts possibility and newness in the present by insisting on the validity of a particular view or perception. The thought occurs to me that I believe (in accordance with a particular vocabulary and perspective) that wherever there is a need for healing, there is a need for fresh perspective, and new interpretations. To heal, is in a certain sense, to receive the grace of a new interpretation of “reality”, one our past and perhaps narrow views couldn’t hold. I also like the way you describe power as immediacy of experience- not mediated. I think that is it… what we are hungry for, many of us. Direct experience flooding through us, profound and genuine, rife with all the scintillating colors of meaning. One thing interesting is that I also have the opinion-belief at present that there is a need for the absolute in all of this, but it is not an absolute that has anything to do with “rightness” of a given metaphor, experience or perception. It is an absolute that says the authentic and eternal identity of you, me, and any being we encounter, is held, by Love, in such a way as to be inviolate to any experience we have in this world. It is the spirit within us whose nature is changeless, for it is of the invisible, timeless domain of Truth. Founding our identity on this experienced reality, I think, can free up the meaning of events of this world to loosen up and take on the myriad of meanings and metaphors I think you are describing. We can depend less on the world as our mooring, and see it more as the flowing sculpture with which we are playing, and as such no longer require a specific or narrow interpretation to be “right”, because our very “lives” (identities) depend on it. In this sense, I am thinking we also agree? In this sense, Noah may be interpreted in countless ways, each of which may provide a unique glimpse into something profound and living. But this absolute at the bottom of it all, is what I am thinking-feeling when I describe power. And it is what each healthy metaphor provides a glimpse of. And it is what I see as expressed in every choice to Love. And it is what I see as making a resurrection possible. And so, it is what it is. It is not subject to interpretation or negotiation, not subject to change in time. Specific events of specific lives can and must be transformed and reinterpreted to invite and allow healing, but this Absolute, what we might call Love Itself, is unaffected by the events that take place. This is what I meant by the Truth is True. And so, an event like the Resurrection, I view as being– outside of any historical perspective– a timeless intersection of Love with this world, a window through which Truth poured, invisibly, and beyond interpretation. I think I agree with your statement that perhaps the specific meanings that unfold in all of our lives may be countless and forever unfolding, but there is a Meaning at the root of such an event, which is not open for debate. Just as the sun is pure light, but gives rise to countless forms of life on this planet. Right on! Love the way you put it. It very much mirrors my experience. Definitely healing is a grace that comes from the wound itself and surprising in some ways, as the new perspective wouldn’t be defined as some new way of thinking only, but coming from a powerful insight that zaps our entire being – changing heart, mind, body and soul in an unquestionable way. Perhaps in pondering the nature of Truth, a useful image for me is a wheel with spokes. The wheel would be the Truth, a timeless center beyond our filtered reach, but yet glimpsed at enough to know something of its nature and existence. Our view is from the edges of the spokes, orbiting around the center. I imagine our physical, time-bound beings as filters, which limit our view, but certainly does not change the objective nature of the world around or in us. Although, in some ways we are part of that objective nature and so, are both within the creative force of the universe and also are composed of it. expand, or deepen, but to what degree, I don’t think we can be sure about. I think there’s a lot of misunderstanding though about the nature of subjectivity and objectivity, don’t you think? It seems to me that admitting to our own subjective limits does not eliminate the existence of objectivity. I may be offline for awhile…leaving tomorrow for vacation in North Carolina, where my husband and I will be visiting family. Debra, I hope you and your husband have a wonderful trip. You posted a great question. I feel as though I could write for days… I’m just not getting to the end of it… So, if this is too long, we could make it a new post just put a link here, or let it stand… Here goes. I think there are two interesting questions in your writing here: one about the extent to which the Truth can be known, and a second about what is objective and what is subjective. There is also that interesting sensation for me that suggests the two questions must in some way be related, though at present it is not easy for me to say exactly how. For instance, if we as perceivers influence the state of the world, and objectivity is therefore but a well-constructed illusion, then what of our world can be said to be true? I think it is best to begin with what is meant by the term Truth. I like the simple definition of Truth which says the Truth is what never changes and can never be changed. Ever. The Truth is true because it cannot help but be what it is, and simply cannot be otherwise. Second, I like to consider that the Truth is not a stale fact of some sort, like the world standard, prototypical single kilogram that is held in a glass box somewhere in France, but a living reality. There is nothing in this definition that precludes the Truth from being aware– self-aware, even– alive, and radiant. With the first part of this definition, we might be inclined to say that 2+2=4 is Truth. However, this phrase would merely be a string of strange symbols on paper to an intelligent alien species, and to an illiterate infant, or to a tree, might remain incomprehensible regardless of the amount of effort spent on indoctrinating them into our shared mindset. We might view these limitations as irrelevant semantics and say that once we get on the same page regarding the meaning of our symbols, this truth is True. And also that the Truth is true regardless of whether or not an infant or a tree can comprehend it. But I don’t think it is necessarily the case that this idea of discrete elements combining in this additive way is always correct, or “true.” For instance, what is the sum of your spirit and my spirit? We might say that the sum of all spirit(s) is Truth, but I would argue that the same might be said of the sum of any two, and I think just One being can be said to be Truth itself. So in my mind “2+2=4” is not a truth, but a rule that generally holds true for certain types of non-everlasting, impermanent phenomena. Thus, in my opinion and in keeping with the definition of Truth I have suggested, it is not meaningful to speak about the quantity of Truth that may be grasped or known or witnessed. I think the Truth is always whole, and can only be experienced or known as such. To experience or perceive anything less, is not to experience the Truth. I further think that the Truth cannot be conveyed from one place to another, from one mind to another, or from one person to another. This world and all its forms and all our arts of communication and rendition can spark a remembrance of the Truth, but never educate anything or anyone outside of the Truth as to what the Truth is. The Truth can never be given to anything or anyone that does not already “have it.” This is a way of suggesting that Truth can only be known through direct experience. That we can experience Truth, or come to know it through the experience of our own being, suggests we (ultimately) are Truth itself. At the same time, nothing in our world (e.g. nothing in a material-energetic realm) is True in the way I have suggested defining Truth. Objectivity and subjectivity then, for me, refer to ways of perceiving or viewing the changeable. Those phenomena that, according to the rules of a given phenomenological realm, are quantifiable and whose quantities may be reliably beheld by most if not all of the perceivers of the realm when they make a measurement in the same way, would be objective in my mind. These are the “facts” we can generally all agree upon. The batter hit the ball and it flew three hundred and forty-three feet. Subjectivity, to me, applies to the meaning we as perceivers assign to the events that are witnessed. For instance, this means the batter is a good hitter, or alternately, that he is a lucky hitter, or alternately, that he is a good man, or even that as a man of integrity he deserved to hit the ball quite far. These are subjective interpretations of the meaning offered by events, and as you wrote in this post, the landscape of potential meanings we can apply is always rich, deep, and varied. I eminently agree with you that we would do well to be flexible in our interpretations, so as to inhabit a world that is fertile with meaning without engendering needless conflict. The larger question for me, that I have tip-toed around thus far, is about our relationship, as Truth itself, to this changeable, malleable and thus “un-True” world. I think this is the essential question of humanity. We are the solution-in-progress that Universe has deployed to grapple with this issue of Truth expressing through form. I don’t dare get too far into this here, as I have already gone on too long, and this is not really a new idea anyway, but I think the promise of Christianity, Buddhism, Sufism, etc. is the notion that we can develop the ability, or vision, to see Truth arising in the action of all things– “things” being the transient, untrue, energetic-material phenomena. This way of seeing is one I would not put on par with other interpretations, as it is the only way of seeing that actually bears witness to what Truly Is. This way of perceiving ends suffering, frees the heart to love, and restores authentic identity to all of us. So, while it is true the changeable world may be interpreted in a myriad of ways, and that the moving aggregations of matter and energy are in and of themselves meaningless, there is actually a “correct” interpretation, e.g. an interpretation that beholds the Truth, a way of seeing that allows the Truth to be True. Other interpretations are simply incorrect– if that is, one’s objective is to know what Truth is. The man hit the baseball over the wooden wall. When we see this event Truly, we behold the meaning and purpose of existence… We commune with Truth. And so… the effects of the Resurrection may be unique for each of us, while remaining the same for all of us. The miraculous incarnation of Truth within matter occurred for all of us, for Truth itself. That is not an interpretation. That is “what happened”, and “is happening”, but it was not an energetic event like a man hitting a baseball, it was Truth being Truth. Thus it affected all beings in the same way, and yet the response of each being will be perfectly True and wholly unique, in his or her appointed hour. Awakening to our true natures, we all behold the Truth, and the Truth is always whole, and yet this does not deny our unique expressions. The Truth is all we can truly share, for Truth is who we are. Have I talked in circles? Excellent post Debra….I agree that our tendency towards linear thinking in the historical perspective is soulless and lacking in depth….finding the right question is always key isn’t? Not so much what happened (as if there was only one answer, one perspective) but rather how can we understand this, given that the story is still around, and still captures our imagination! A rich, thought provoking and wonderfully written post Debra. I thought the sentence “But reality slips out of reach as its ungraspable nature can never be completely objectified by our limited subjective perspectives” to be quite profound. Hadn’t given the movie any thought but you’ve sparked my curiosity. I’ll have to get back to you after I watch it. With an eye and ear for the story, without having a particular axe to grind, the movie is great. The film production is very well done. What wonderful shares are birthed when one finds they have nothing to defend, only to enjoy! -x. Great post, Debra. I’m even more determined now to see the movie which rather extraordinarily is playing in the cinema in Pucallpa where I live on the banks of the river Ucayali which then becomes the Amazon. I really liked ‘Black Swan’. I think you would find it interesting. People tell me ‘Fountain’ is very good too. I found ‘Requiem for a Dream’ relentlessly gruelling. Powerful but profoundly depressing. No redemption at all. 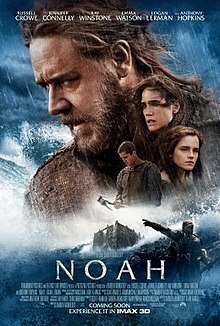 I’m a big fan of Noah and hope to see this movie in a few months when it runs as a download or on a cable tv movie channel. I’m also a big fan of your review here Debra; the way you identify the myth and the linear history of the events and seem to suggest the importance of both. Or at least that’s how I interpret your excellent writing. All of the symbols available to us in the Biblical flood or any mythological flood and the gathering of creation in one ark-one earth, etc. is maybe an individual passion, but the timing of when that Ark was built seems to be a consensus…when it wasn’t raining. On the one hand that reads like a great weather report, but also a human who keeps nose to the grindstone-integrity no matter what detractors say. Biblical behavior would be locked up in today’s world. Yes, and the character of Noah comes through very well in the movie. Lol, Biblical behavior would be locked up today! That is a great point! It would be great to hear what you think of the movie Steve. Beautifully written review, thank you. I so long to see that movie, him being one of my favourite directors. I love how you juxtapose various kinds of “truths” in your article. Needless to say, I’m also siding with the truth of our deepest psyche. I have only seen one of his other movies, Life of PI, which I loved. Are there others that you would recommend? Yes, you are correct. Aronofsky was not involved in the Life of PI. He wrote the script for PI, that was my confusion. The Fountain, yes. That is one weird movie, but I liked it too. Great article! Where I’m not certain of your thinking is the point quoted above, “These divisions have created an atmosphere of defense and offense in every social aspect of modern culture.” The divisions created by literal thinking? I tend to think it’s the other way around – that all division follows from the concept of self-and-other as the core duality. I may pass on this movie, for more and more, I find myself too nauseated by the antics of so many people who take the myths of tribal deities as historical fact – which of course, is your very point. I wouldn’t argue with the idea that the initial divide is self from other, but rather the nature of division. You make a good point though, because any time we incorporate something into ourselves, we are still inclined to maintain the primary division of self and other. But literalism comes from the quest for one truth, yes? So perhaps the primary duality is forever being swallowed up by the attempt to make Self the one and only. Of course it’s impossible to maintain, and that seems to be the state of consciousness we are waking, or trying to wake up from. The movie has a mythological edge because there’s no escaping it, to my mind anyway. It’s an interesting blend of the modern environmental apocalyptic fantasy with the biblical story of Noah. Did you see Life of PI? Aronofsky produced that film too. Yes, I saw Life of Pi and enjoyed it immensely. Interestingly enough, the opposite pole from the idea that events ever be resolved into simple true/false categories. Literalism comes from the quest for one truth? I don’t know. I suspect it’s more complex than that. As an example, I would note that there are believers in all three major monotheistic religions that are tolerant of other beliefs, and then there are the fundamentalists who are not. So there seem to be other factors (like unacknowledged doubt) at play. I didn’t mean to suggest that literalism comes only from the quest for one truth, but that that may be part of it. By literal I am referring to anyone who insists that things/events mean one thing only and can never see or accept layered, symbolic meanings alongside the more obvious literal text. I suspect that for someone who is more literal minded, there’s an attempt to narrow truths down, rather than expand them. For example, God is either good or evil, but never a bit of both. I also just realized that I misspoke about Darren Aronofsky being involved with Life of PI. He was involved with the movie PI. Sorry for miscommunicating. I guess I am just as concerned with it being self-fulfilled by a secular culture that thinks they have left Judeo-Christian mythologies behind as I am worried about overly-literalist Christians. And, yes, great point, I am eternity, and death is one of the things we are here to do. Joseph Campbell’s teaching that to concretize mythology reveals where people get into trouble. Once the story becomes fact, you have lost the story, its meaning and its mystery. This is where Noah became problematic for me, as you have discussed, Aronofsky’s literalness. This is ironic as his previous films have incorporated very creatively metaphor and myth to tell a story. I think he is partially successful in doing this in Noah. One archetype that is a thread through all his films including this one is the tortured dreamer. Russell Crowe’s performance definitely echoes back to the main characters in Black Swan, The Wrestler and The Fountain. Good point about Aronofsky’s prior film. Life of PI is a great film! I wonder if he wasn’t somewhat bogged down in the historical dilemma himself with Noah. I have not seen enough of his films to recognize the tortured dreamer, but Noah definitely seemed to fit that description. I enjoyed the dream segments but again was a little disappointed with the ending in which the dream seemed to manifest, again in a literal way. Boy, if dreams only obeyed that rule all the time eh? Oh well, it’s not likely, but I can’t help but wonder if more literalists will be bugged enough by the movie to get the joke of their own tendency toward needing validation through historical evidence. I have to admit that I had no desire to see the movie “Noah”, largely because the stories of the Creation-Flood narratives are so rich and complex (especially when set in the context of the related narratives in Mesopotamia) and a general lack of understanding of the powerful truths that myths represent, across time and culture. I was heartened to read your review and interestingly today I listened to a podcast from OnPoint radio that indicates that the movie tries to be true to the biblical account of applying ancient truths to some of the problems we are facing today. It is an interesting movie, especially for those who are watching for the sense of the story. Aronofsky (edited for correction:, no, he did not) also produced Life of PI. If you have never seen that movie, I would recommend it. It is unemcumbered with the issues of historicity that distort the viewing of Noah. It is one of my favorite movies of all time. Thanks for you for sharing your thoughts here William!